Webcams can be convenient for a variety of reasons: They show you the current weather, the necessity of certain kinds of clothing - and they are a fun way of checking the state of cities and sightseeing attractions. In Vienna, there are many webcams. In this article, I have collected some of my favourite Vienna webcam websites - as a directory with pre-selected webcams, since many Vienna webcams that I have come across are frankly rubbish. Vienna City Council: The city council of Vienna officially provides several very nice webcams in differnet locaitons of Vienna. My personal favourites are the one looking at the Hofburg Palace and one on the Strauss Memorial in the Stadtpark. 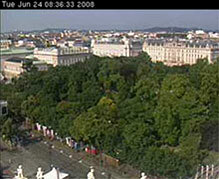 There are seveal webcams in the Burgtheater, showing different parts of its surroundings and the Ringstraße. Another set is situated at the Rathaus City Hall and presented very nicely. Feratel.com: Feratel has another webcam from the Burgtheater's roof, featureing the Rathaus City Hall. Panoramablick.com: This website is done by a company from Neumarkt, my hometown near Salzburg; is is a directory of many webcams from Austria. In terms of Vienna webcams, the one from the Wienerberg Water Tower in the south of the city is particularly noteworthy; and the one on the Hofburg Palace. But there is many more, so the website is certainly worth a visit. Kurier: The daily paper and tabloid of Kurier has a well-presented collection of webcams in Vienna. Some devices of their Vienna webcam directory are operated by the company itself, others are references, so they partly overlap with other directories listed above. However, the Kurier Vienna webcams come with a fancy map of Vienna, which makes it easy to select a webcam from a particular area. 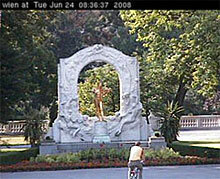 Addon: Last, but not least this webcam facing the Danube in Vienna is provided by a local IT company; high resolution and frequent updates make it one of Vienna's most sophisticated webcams.